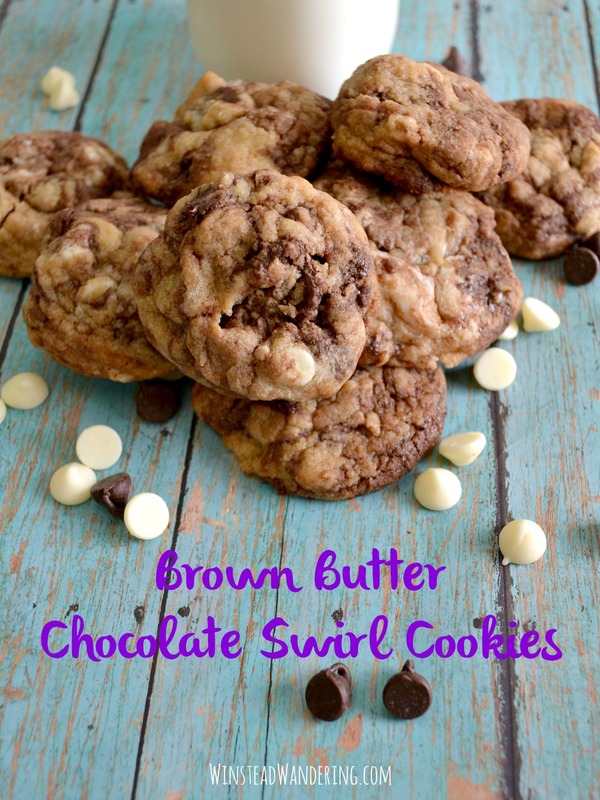 Not only are these Brown Butter Chocolate Swirl Cookies a unique and delectable twist on a classic dessert, they’re also prepared on the stove in just one pan! My brother-in-law began his first year of college just a few weeks ago. He’s going to school in New York so, along with mailing Unc Noah her artwork, B began asking if we could send him cookies pretty much as soon as he left. Of course I loved the idea because I’m always looking for an excuse to bake and give away treats, and also because my mom used to mail me cookies when I was in college, too. One thing or another seemed to come up nearly every day for a couple weeks, and then my mother-in-law decided to make a last-minute trip to visit Noah. Perfect timing! Instead of sending the cookies through USPS, we sent them via Delta right in her carry-on. 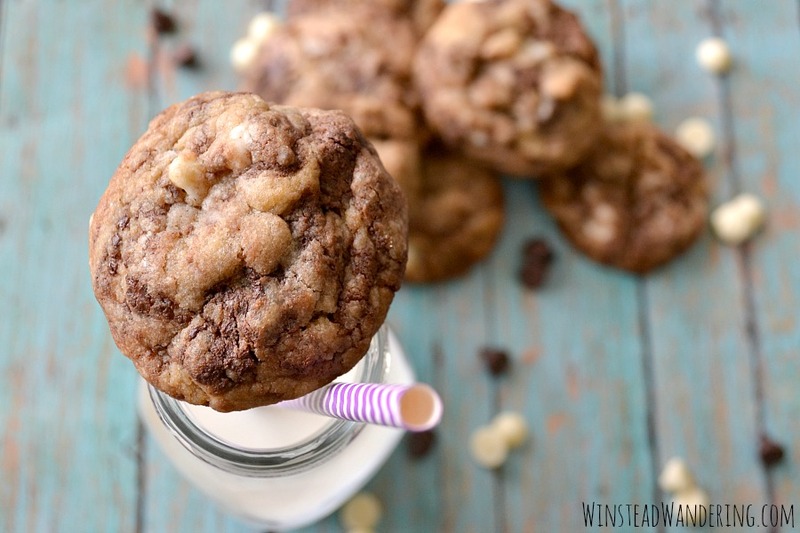 I took the cookie-making opportunity to make these Brown Butter Chocolate Swirl Cookies. In addition to the depth of flavor the brown butter provides, this recipe is unique because the whole thing comes together on the stove in a saucepan. Yup, after browning the butter, you add the rest of the ingredients to the pan, mix it all up, and then you’r ready to shape cookies. B and I had a great time making these cookies together and, of course, we all enjoyed eating them, too. Browning the butter and then melting in brown sugar provides a wonderful toffee flavor that takes these a step beyond traditional chocolate chip cookies. They’re further elevated with three different flavors of chocolate chips, some of which melt in the warm dough to leave sweet swirls throughout. 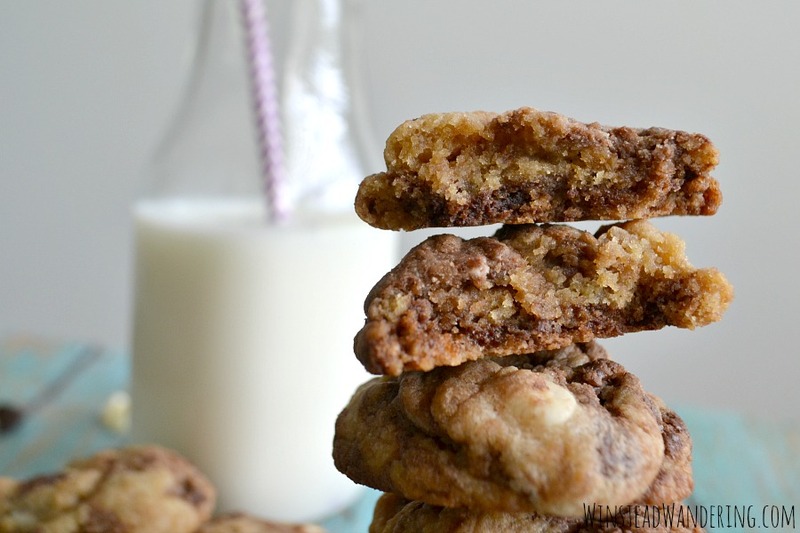 The end result is chewy, tender cookies with plenty of chocolate and toffee flavor in every bite.